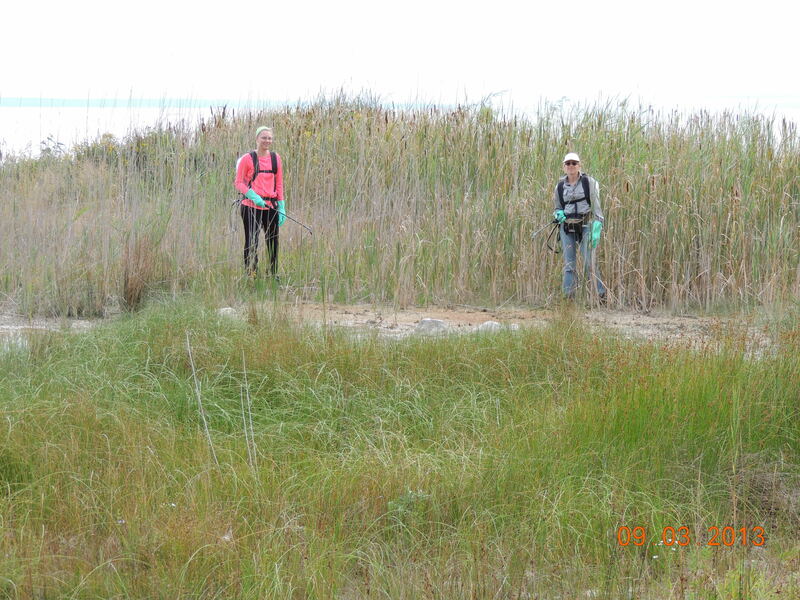 Pam Grassmick fills us in on the Beaver Island Association’s Invasive Species Initiative and island-wide Phragmites control program. What aspects of Phragmites management are you most involved in? Beaver Island Archipelago, Lake Michigan, Charlevoix County Michigan. Program includes: Beaver, Garden, High, Hog, Whiskey and Trout Islands. The Island’s natural resources have been damaged as a result of weather, logging and recreation. Based on a 2010 report by the Nature Conservancy of Canada entitled “Islands of Life”, Beaver Island was included in the top ten islands with threatened biodiversity. Phragmites is a primary invasive plant species impacting this biodiversity and both the natural and human communities who reside there. The Beaver Island Association works in partnership with government and tribal agencies, non-profit organizations, and the community to develop projects aimed at eliminating invasive Phragmites from the islands. The Invasive Species Initiative Workgroup collaborates to identify potential projects and funding sources for each field season. In addition to ongoing partnerships with semi-annual meetings, the Association holds an Invasive Species Summit to inform and educate residents, local government staff, and visitors of the dangers of invasive species and actions they can take to lessen these threats. The Initiative is volunteer staffed through the Beaver Island Association. Projects are developed and implemented through partnerships and are almost entirely grant funded. What are your goals and objectives for the program? The purpose of the initiative is to identify & inventory endangered species and invasive plant species on Beaver Island and devise environmentally appropriate & effective measures to protect the former and control the latter. What type of land does your program target? Coastal island communities, some human occupied and some with little or no permanent development. Major habitats include deciduous forest, beaches, and woody wetlands. A coarse-level survey of Beaver, Hog, High and Garden Islands was completed in 2012. The survey and final report identified management actions for the islands, including Phragmites as one high priority invasive species. A comprehensive shoreline treatment of the four islands occurred during 2012. Follow-up spot treatments were completed in 2013. During the 2013 follow-up treatment, visual observations indicate that the eradication efforts are being successful. This is evident by lower stands of Phragmites overall in areas previously treated, fewer stands containing seed heads and limited expansion of stand areas. New growth stems were treated for a second consecutive year and we are hopeful to see even more reduced production in 2014. Can you share important lessons learned both about what worked and what did not work? Many of the populations have been treated previously, but multiple treatments are typically necessary to eradicate populations. Aggressive monitoring for Phragmites should be a part of future invasive species surveys, keeping in mind the difference between native and non-native invasive varieties. Consistency with survey and treatments and maintaining our partnerships is key to improving eradication success.